Opinion - End of an Era? Do investors realize how good they’ve had it over the last 8+ years ? On the obvious side, the length and strength of the equity bull market has been well publicized. Since the March ’09 bottom, US equities are up over 300% (S&P 500®) while global equities are up over 200% (MSCI World). Do investors realize how good they’ve had it over the last 8+ years? On the obvious side, the length and strength of the equity bull market has been well publicized. Since the March ’09 bottom, US equities are up over 300% (S&P 500®) while global equities are up over 200% (MSCI World). 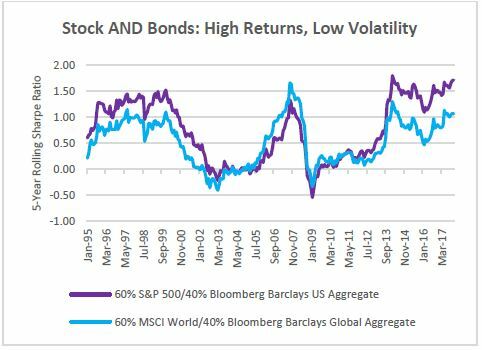 Don’t cry for global bond investors who have earned nearly 4% annualized returns on a starting yield of 3.5% during the same period (Bloomberg Barclays Global Aggregate). Insofar as central banks wanted to suppress interest rates, boost asset prices, and create a positive “wealth effect”, they have been spectacularly successful. Only time will tell whether their unprecedented response to the Great Financial Crisis (GFC) will turn into the next asset price bubble and subsequent crash. This month, we ask “Is the bull market in bonds over?” and explore some of the portfolio implications of higher interest rates. The future direction of bond yields is likely to be higher. “Likely” is an important modifier we will come back to later. To understand why, let’s start with the key driver of real yields before moving to other factors. The central tenet of our real rate outlook is that global economic growth is picking up steam. In some form of equilibrium, real yields should correlate with real growth rates as a stronger (weaker) economy will increase (decrease) demand for borrowing (all else being equal). No surprise here: yields tend to rise during recovery/expansion and fall during slowdown/recession. So we expect the continued strengthening of the global economy to put upward pressure on yields. Consistent with a stronger global economy and diminishing overcapacity, inflation is likely to head higher as well. Why? First, commodity prices have been rising and inevitably bleed into inflation. Second, in the major developed markets, unemployment is either extremely low (US, Japan) or trending downward quickly (Europe), taking up slack that will eventually seep into wages, and then prices. Finally, many of these developed markets are currently running at growth rates that exceed their long-term potential (as determined by labor force growth and productivity), which should stoke inflationary pressures. Add higher inflation premiums to higher real yields and you get even higher nominal yields – the archenemy of high quality bonds. We can add two more factors into the higher rate equation – central banks and supply. It is no secret that the major central banks are all somewhere in the “normalization” process – either already raising short rates (Fed, BOC), thinking about raising rates (ECB, BOE), slowing QE purchases (ECB, BOJ), or outright shrinking their balance sheet (Fed). Suffice to say, central bank policies are likely to drag rates higher, too. Lastly, as global healthcare costs rise due to aging populations, austerity wanes in Europe, and US tax reform blows a bigger hole in America’s structural deficit, government borrowing shows no signs of slowing down, and in fact, may be accelerating. Not only is the supply of sovereign bonds growing, for the first time post-GFC, it is growing net of central bank QE programs. Bond prices, like all prices, are not immune to the laws of supply and demand. This imbalance of rising bond supply (issuance) and falling central bank demand can only be reconciled by falling prices and rising yields. So when you add it all up, is it a foregone conclusion that rates are going higher and the 30+ year bond bull market is over? Maybe not. All the arguments presented above have been trotted out in one form or another in recent years. Markets, however, have not cooperated. Tough talking central bankers have proven more dovish in their actions. Global growth had been uneven and slower than expected. Economists have been mystified by the Phillips curve and unable to explain why inflation has been dormant even as central banks printed truckloads of currency. The consensus call for higher rates has proven elusive and that should give investors pause. In spite of this, we think there are some important changes afoot. One, global growth appears to be stronger, broader (more sectors), and more synchronized than at any point since the GFC. Two, central banks (particularly the Fed) have progressed from simply talking about normalizing to real action – raising rates and ending QE. Three, inflation is starting to appear in the data as economies run above potential growth – especially in the US which will get a further sugar rush from recent tax stimulus in an economy already humming along. Do we know that rates will move higher for certain? No. But the distribution of future rates seems more asymmetrically skewed today than at any point in recent history. We can think of many reasons why rates should rise. We can think of almost no reasons why they should fall. How high might rates go? We’re not sure and it may not be the right question. 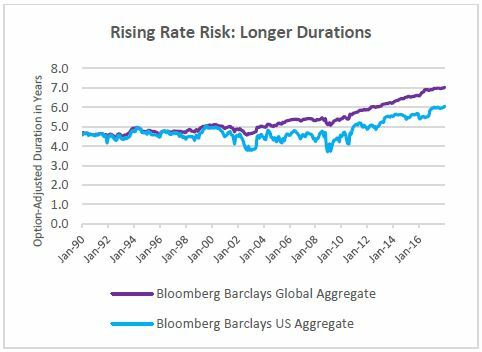 With today’s low starting yields, long index durations, and tight credit spreads, portfolios are simply more interest rate sensitive. Even a modest increase in either real rates or inflation premiums could prove painful to bondholders. More importantly, this phenomenon could mark the end of an era for asset allocators. Thanks to the unprecedented level of central bank intervention, the recovery and expansion of the last eight years has fostered both rising stock prices AND rising bond prices – an unusual combination, to be sure. Today, however, we believe attractive bond returns could only be the product of falling interest rates due to a slowdown in growth, backtracking central banks, or waning inflationary pressure. Unfortunately, given current valuations and the extreme optimism priced into equity earnings, this scenario would likely crush stocks. We believe yields will continue their recent trend and move modestly higher. Regardless of whether we’re right or wrong, we think investors can no longer have their cake and eat it too. In the current growth environment, stocks and bonds are unlikely to keep rising together. Something has to give. Is the bull market in bonds over? Equity investors better hope so.